These 8 classes will be offered at 10am on Fridays and will focus on Jersey Fresh or summer fare recipes along with a featured basket. You are not obligated to make the featured basket, but the recipe and tasting will still be offered. Strawberry basket made with a 3”x 6” oval solid wooden base with accents of your choice. It has a shoulder strap for easy picking but can also be used as a purse. Chocolate dipped strawberries will be the tasty treat along with the recipe. Be ready to tote your s’more makings to your fire pit. This 5”x 8”oval or 10" round (you pick) has a wooden divider which also acts as a handle. Make own s’mores as your tasty treat for this class. This wooden base 8" round-bottom basket with oak handle will have blue accents to be used as a muffin server. Blueberry muffins will be served along with the recipe. Weave a 10” round basket with an insert to fit your deviled eggs. Deviled eggs will be served along with the recipe. A round twined bottom basket with an insert for chips and salsa with added feet and leather handles may be woven in this class. Mango Salsa will be served along with the recipe. A carved wooden handle will be added to this 8” round basket that stands about 10” tall. Peach cobbler will be served along with the recipe. This large sturdy basket has an adjustable woven strap. The Large basket is approx 13”x 14”x 10” tall and the child size is 9”x 11”x 9” tall and will make a perfect addition to your gardening needs. Bruschetta with Basil be served along with the recipe. 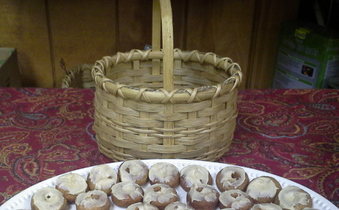 Friday, August 24, Apple Cider Donut Basket $35.00 This 8”x10” oval basket with sleek wooden handle can be used to deliver a batch of these tasty treats. Apple cider donuts will be served along with the recipe.